Some dreams become real. Other dreams remain as dreams. I once had a dream (or shall we call it, fantasy) that one day I will have a book in Malacañan to contribute to our country’s history. This has just been fulfilled with my book on The Journey of Malampaya Phase 3 Project. 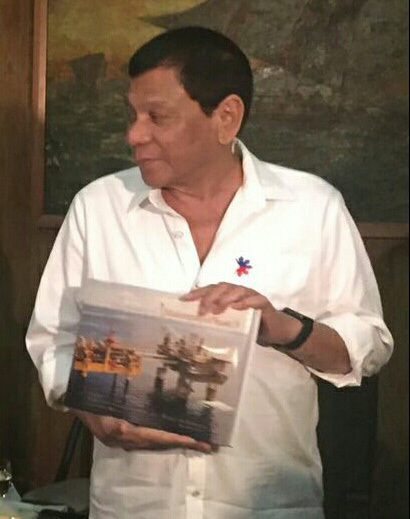 I got a shock in my life this morning when I received a Viber message from Chiqui of Shell, with a photo of President Duterte holding my book on The Journey of Malampaya Phase 3. It bears a short caption “Spotted in Malacañan Palace yesterday”. This is a lesson on how thoughts become a reality. “An engineering marvel and a mammoth construction never before seen in the country, Malampaya Phases 3 (MP3) Depletion Compression Platform is a magnificent sight to behold. MP3 has earned a special place in this country’s history as the first gas platform designed, constructed and installed in the Philippines by Filipinos, for Filipinos. As I look forward to this appointment in history, I felt deep within that the creation and compilation of this project’s photos would immortalise its glory. My personal mission would be to visually record its every aspect for the generations of filipinos to come–as seen with my very eyes and my camera lenses. It would be not just another job to do, but indeed, a very special assignment to deliver. As eyewitness to key MP3 events, I would depict their visual representation by freezing moments before their traces vanished forever. Though “frozen” in time, these moments are not arranged in sequence in this book by following the progressive timeline. On purpose, I presented this “flashback” of impactful events across different topics to show varying perspectives. In seamless fashion, this collection of photos meshes these seemingly unrelated instances into one definitive experience–one overall defining moment, as it were. Given the extent of creating numerous episodes in pictures, I strove to faithfully capture slices of history as these transpired. People in these coffee table book’s images represent the multitude of many others who breathed life into these riveting scenarios, with their contributions determining the project’s out comes. I regret that the book’s physical parameters and constraints limited to a select few the images of the significant many, including the people who opted to remain unseen. This book honors you, all the men and women of the MP3 project. You have made history. Initially, you were behind the first offshore gas platform made in the Philippines for Filipinos. You have now catapulted your good selves to the forefront as pioneers of a novel genre. To the next generation of Filipinos, may this visual reminder etch this in your collective consciousness the inimitable yet mostly unheralded greatness of the generation that preceded you–be they your brothers, sisters, friend, fathers, mothers–all who have labored in unison to make this your legacy.